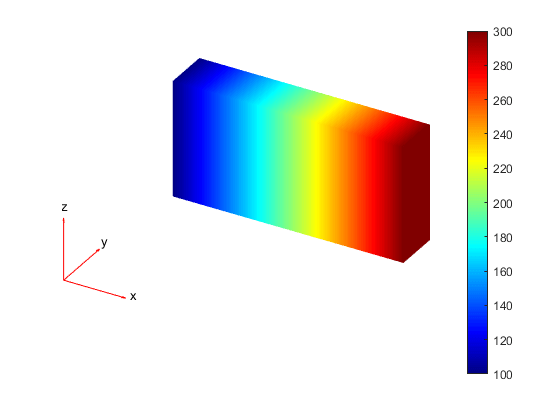 pdeplot3D(model,'ColorMapData',results.NodalSolution) plots the solution at nodal locations as colors on the surface of the 3-D geometry specified in model. pdeplot3D(model,'ColorMapData',results.Temperature) plots the temperature at nodal locations for a 3-D thermal analysis model. 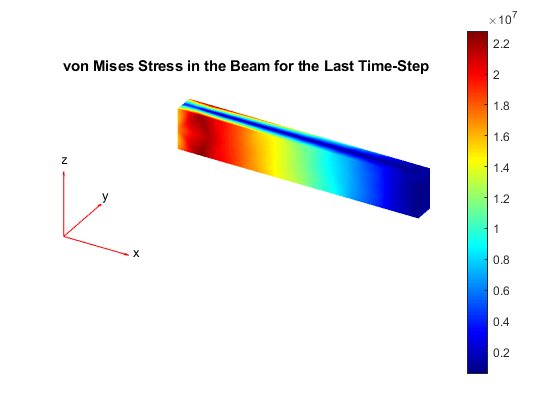 pdeplot3D(model,'ColorMapData',results.VonMisesStress,'Deformation',results.Displacement) plots the von Mises stress and shows the deformed shape for a 3-D structural analysis model. 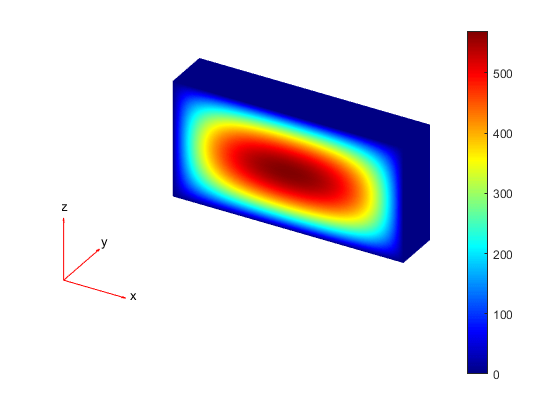 pdeplot3D(model) plots the surface mesh specified in model. 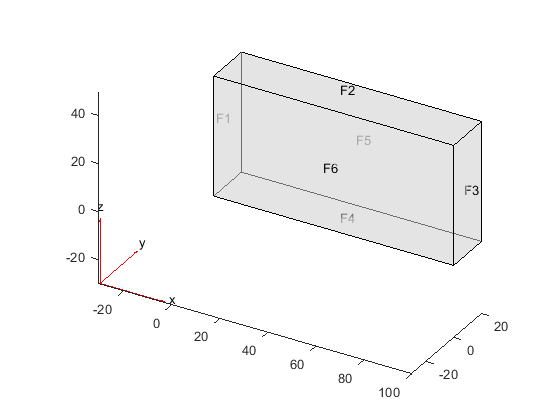 pdeplot3D(mesh) plots the mesh defined as a Mesh property of a 3-D model object of type PDEModel. pdeplot3D(nodes,elements) plots the mesh defined by nodes and elements. 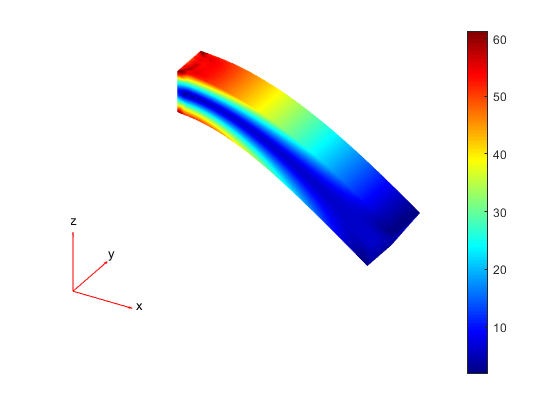 pdeplot3D(___,Name,Value) plots the surface mesh, the data at nodal locations, or both the mesh and data, depending on the Name,Value pair arguments. Use any arguments from the previous syntaxes. h = pdeplot3D(___) returns a handle to a plot, using any of the previous syntaxes. 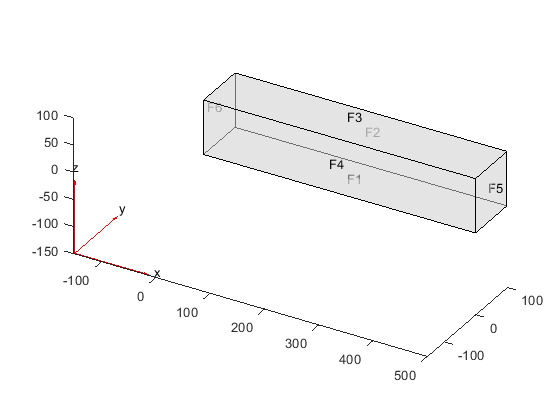 Plot a PDE solution on the geometry surface. First, create a PDE model and import a 3-D geometry file. Specify boundary conditions and coefficients. Mesh the geometry and solve the problem. Access the solution at the nodal locations. Plot the solution u on the geometry surface. 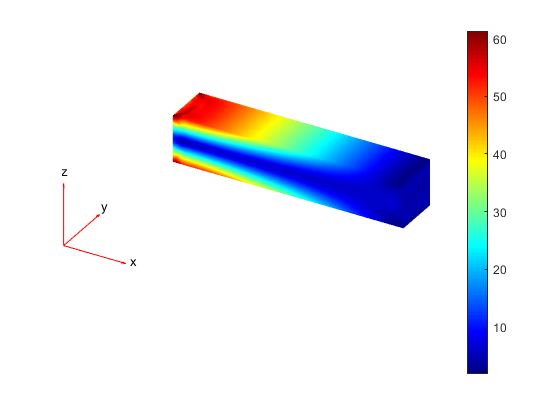 Create a structural analysis model for a 3-D problem. Specify that face 6 is a fixed boundary. Specify the surface traction for face 5. 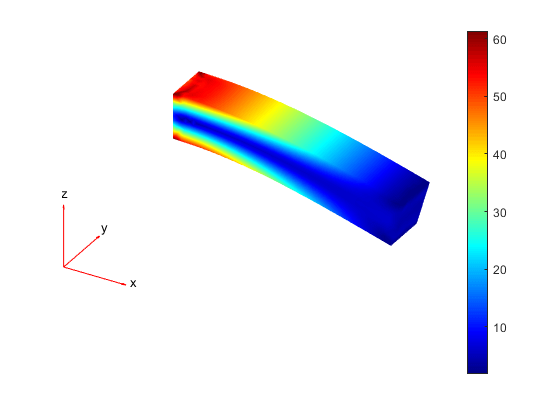 Plot the deformed shape with the von Mises stress using the default scale factor. By default, pdeplot3D internally determines the scale factor based on the dimensions of the geometry and the magnitude of deformation. Plot the same results with the scale factor 500. Plot the same results without scaling. 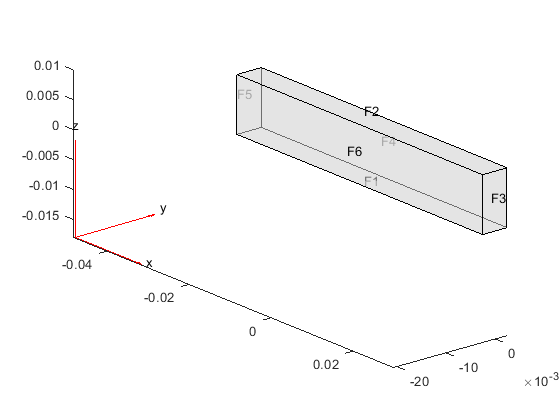 Create a PDE model, include the geometry, and generate a mesh. Another approach is to use the nodes and elements of the mesh as input arguments for pdeplot3D. Display the node labels on the surface of a simple mesh. 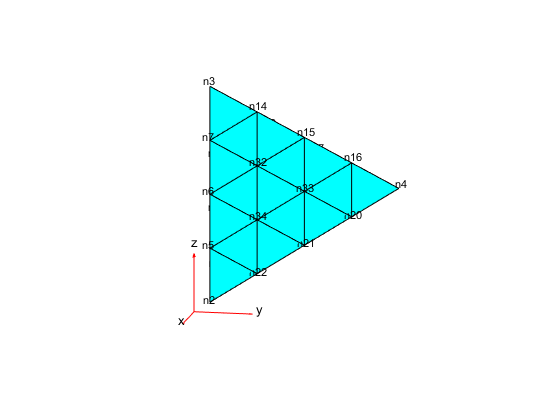 Nodal coordinates, specified as a 3-by-NumNodes matrix. NumNodes is the number of nodes. Element connectivity matrix in terms of the node IDs, specified as a 4-by-NumElements or 10-by-NumElements matrix. 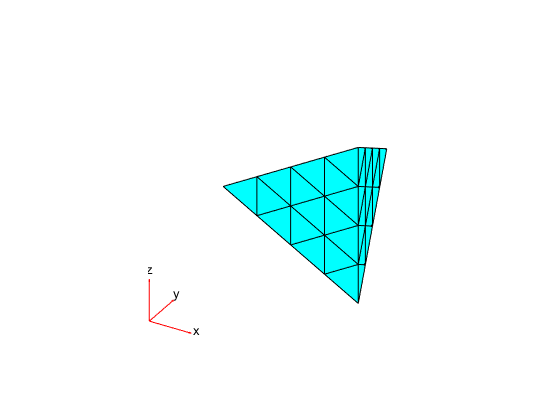 Linear meshes contain only corner nodes. For linear meshes, the connectivity matrix has four nodes per 3-D element. Quadratic meshes contain corner nodes and nodes in the middle of each edge of an element. 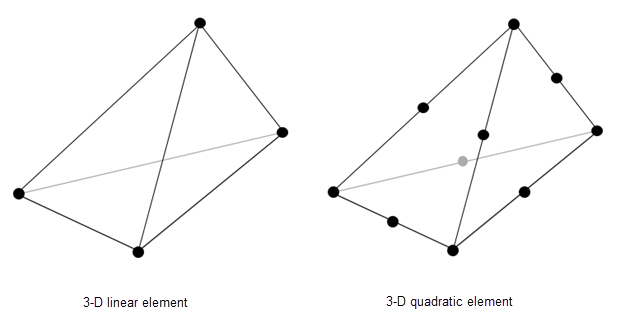 For quadratic meshes, the connectivity matrix has 10 nodes per 3-D element. 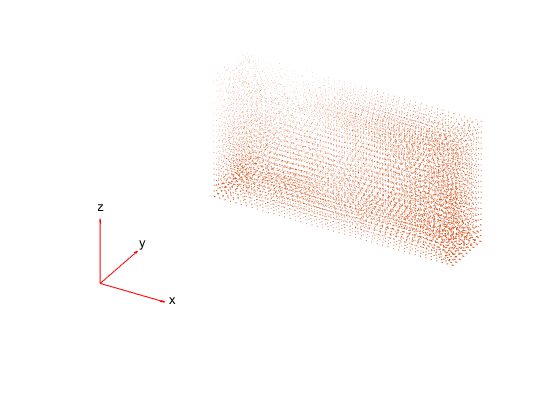 Data to plot as a colored surface, specified as the comma-separated pair consisting of 'ColorMapData' and a column vector with the number of elements that equals the number of points in the mesh. Typically, this data is the solution returned by solvepde for a scalar PDE problem and a component of the solution for a multicomponent PDE system. 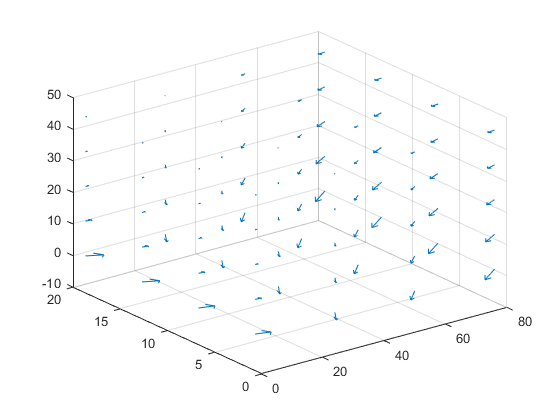 pdeplot3D plots the real part of complex data. Indicator to show the mesh, specified as the comma-separated pair consisting of 'Mesh' and 'on' or 'off'. Specify 'on' to show the mesh in the plot.